While staying at a popular tourist hotel in Manila, a painting in the lobby caught my attention. 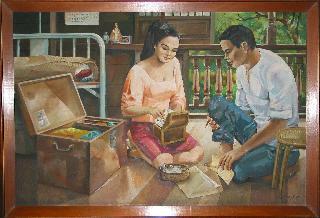 It depicts a young couple kneeling on the floor of a traditional Filipino home. I first noticed the polished wood floors, the balusters of the ventanillas, the capiz shell window panes and the rural scenery beyond. Next my attention turned to the couple and what they were doing. I wondered how they were related and what brought them together at this moment in time. The painting is filled with details, from items on the window sill, the bed and hope chest, a photo and items taken from the chest, that together tell a story about Filipino family life and culture. Instead of sharing my own interpretation, I'll let the reader study the painting and make their own.